Klaipeda always was a city to me where life and even time seems is going slower. It all depends on the wind blowing from the sea - and it gets stronger in the late autumn, winter, and early spring. At that time, people are searching for a cozy place where they could to get warmth and delicious hot food. There is such a street in the center of Klaipeda, with a dreamy name - Liepu what means Linden. And there you can find even two restaurants pearls - restaurant Monai and MOMO Grill led by the same owner and chef. The most interesting thing is that two things - pleasant service and great, delicious food- connect these two restaurants. Today we had best lunch ever! Everything was perfect from starters to desserts. Our waiter was also very funny and attentive, what made our impression even better. I am so happy Klaipeda has such an awesome place, finally! Best recommendations and good luck! Today, I will talk about MOMO GRILL restaurant. 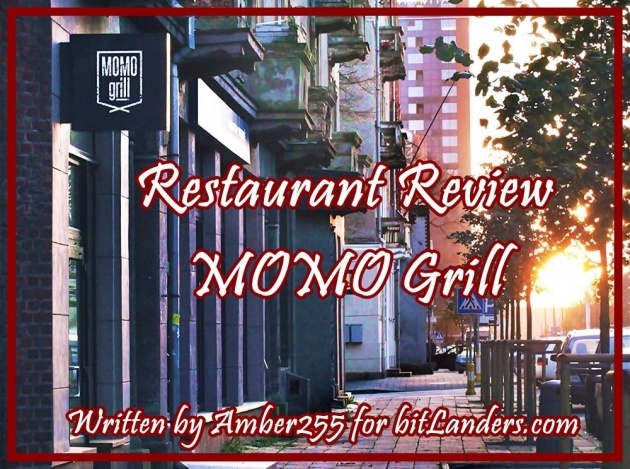 Is the MOMO GRILL in Klaipeda the Best Port City Restaurant? 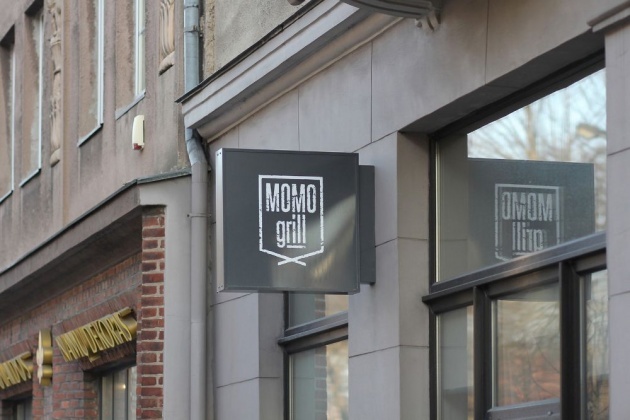 Almost all Klaipeda residents have heard about the MOMO Grill Klaipeda restaurant. Why is this MOMO Grill so exclusive? I must say that I have not been before in this restaurant. Have heard much good about the food there and read a lot of reviews, but somehow had not the chance to visit it. So, two days ago we just booked a table, and here is my review. 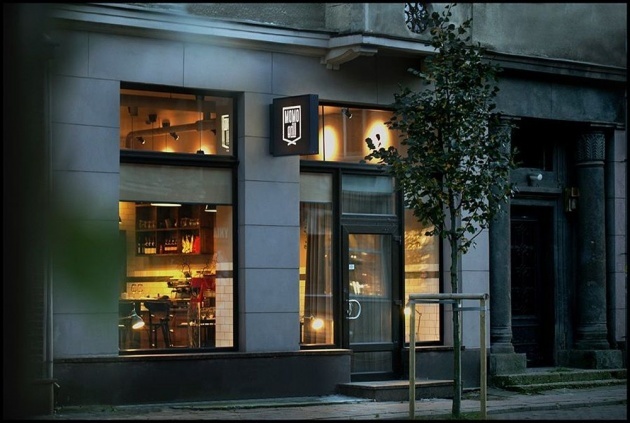 MOMO Grill - restaurant, located in Klaipeda. The primary idea of the restaurant owner and chef was to open a restaurant with excellent service, the best quality food, and everything else in Klaipeda center. In addition, as an extra pleasure for himself and others, too set up a small pub. The little restaurant of grilled dishes - grilled meat, fish, poultry (and all fresh) with changing garnish, with matched wines. 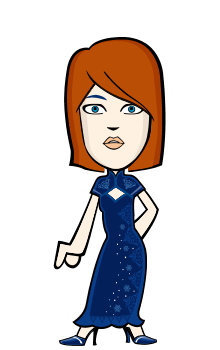 To welcome a small number of guests without stress and act on the principle of reservations. To this day, the result was: he closed the old La Cle restaurant after a short life, and MOMO Grill blooms. And it bloomed as not many Lithuanian restaurants. Anyway, we could expect success because the chef and owner is a talented chef elected as the best chef in Lithuania in 2008. He also not once won medals at international culinary competitions and trained in the famous Noma restaurant in Copenhagen. 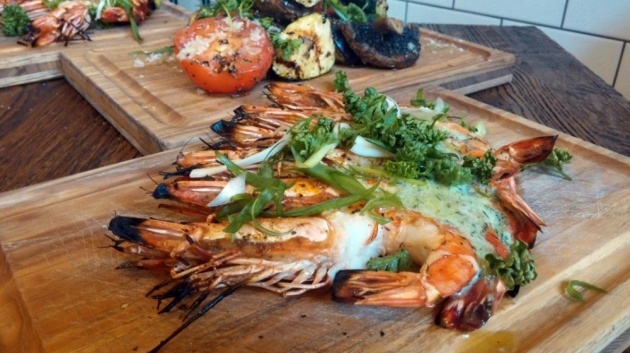 As I mentioned, the menu consists of dishes made from the freshest ingredients, mainly on the grill. The supply of dishes is small but worked out to perfection. Every week they change the garnish menu. The chef's special dish is constantly offered (daily/evening offer). 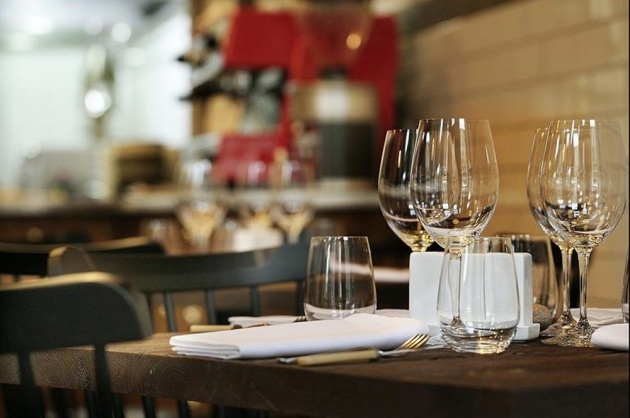 There are few places in the restaurant, exposed to the principle of pre-booking. So, they cannot serve many people in one evening. To say short, the chef and restaurant owner wanted a place for himself for self-realization (understand when you want to escape from the main restaurant's activity), but the law of life has worked perfectly: the activity that delivers the most pleasure is the best. The restaurant has its own mobile app! Holders of the MOMO Grill apps are the first to learn the menu news, the daily lunch offerings. The gadget is updated daily. And the last thing to mention - MOMO Grill wins the 30 best Lithuanian restaurants competition a few years in succession. The interior is modern cozy. The huge heavy curtains that cover the entrance not only do the heat guards function but also bring coziness. A small, fully filled space also contributes to coziness. Quality materials, fine wooden tables, and chairs, metal, stone move us to Scandinavia. Or maybe not because Lithuanians have long appreciated and used the Scandinavian style for a long time. The idea of the interior was to create a modern environment similar to Scandinavian style because the owner a few years lived in Scandinavia, so he brought home some ideas. 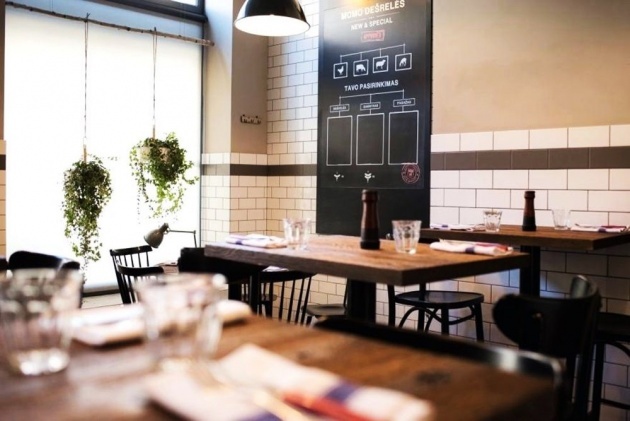 He formed an open area to the kitchen, and in such a way, the guests can monitor the working kitchen staff from the restaurant while waiting for the food. 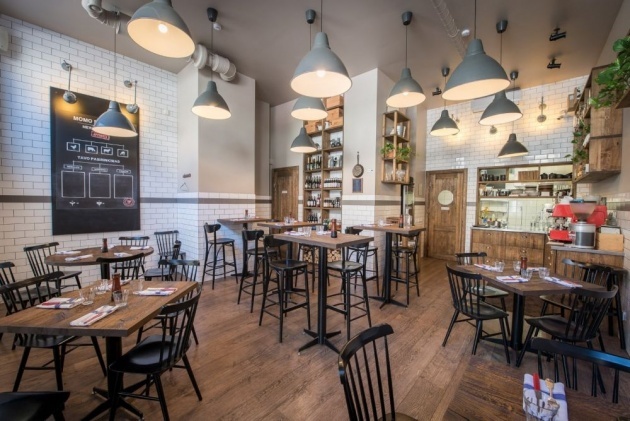 Hanging and wall lamps of industrial-style, chairs and shelves in a Scandinavian style full of various accessories create an unusual image of the restaurant. The wood products with a rough peeled surface give the naturalness to the interior. I would add table utensils to this point. The food is served in utensils of different textures, different styles, different colors, and restaurant uses the old or aged metal tools. However, this detail does not go unnoticed - beautiful and interesting. Some people like it, some don't, but they fit perfectly to this interior. One of the best tasted by me. And not only in Klaipeda, in Lithuania. And there is nothing to add. Yes, according to Klaipeda standards, it is expensive: snacks 5-7 Euro, main dishes 14-17 Euro. But they use fresh meat of high quality, melting potato pie with fantasy, deliciously prepared garnish vegetables. So for two people, 50 Euro here is not only normal but also worth it. Well, if to search for minus, the garlic to the fries appeared to us a little burned, and the creme on the Creme Brulee dessert - a little too thick and too hard. But this did not diminish the overall impression of good food. And, by the way, we were pleasantly surprised by the portions because we were expecting a small food portion when you go out neither satiated nor hungry. But the reality has surpassed all expectations - meat or fish here are big portions. The restaurant buys beef directly from farmers, the hunters deliver their fresh catch too, and fish - seasonal local or brought abroad some fishes we do not have here. And good quality ingredients in good chef's hands turn into delicious dishes. Adding a well-matched side dish and a well-prepared sauce - a happy dinner is guaranteed. Im a regular customer at MOMO GRILL and I love their creative recipes with great options for fish and wonderful desserts! The chefs are very talented and I’ve never been disappointed by this restaurant! Very well suited for meat eaters and those who like the fish too. Grilled vegetables, beetroot, fresh cheese, and stuffed rustic eggs or tongues are served as snacks. Both stuffed eggs and tongue I really liked. Just maybe everything is served too similarly. We also tested mussels, both standard in wine sauce and served with potatoes in tomato sauce. They do not try to create something incredible from the salad; serve them very standardly. It is important, they are fresh, with good sauce and extraordinary additives. But the point is the grill dishes: duck, veal, catfish. The duck was served with carrots spiced by cumin and potato gratin. Entrecote was served with grilled Portobello mushrooms and grilled zucchini. Veal - with fried potato halves and carrots. Catfish with potatoes and snow crab meat, and vegetable garnishes: be it Brussels sprouts or zucchini. The chef uses a lot of fresh herbs to highlight the taste. And another important thing: sauces. Desserts are both traditional: ice cream, mousse, cakes, and Creme Brulee. All the snacks and main dishes here are prepared on the special Josper grill, which cost as a luxury car, so the taste and aftertaste of the dishes are difficult to replicate without this device. Yes, MOMO Grill was the first in Lithuania to buy such a grill. Culinary Hits: Beef Tartar - 12 Eur, lamb steak with Sicilian vegetables - 20,40 Eur. The wine choice is definitely good. Wine is quality, but be ready to pay for two cups about as much as in many other places in Klaipeda you would pay for a bottle. The MOMO Grill is just a few minutes to the Wine Club shop, so most of the wines are from there. Grill wine card is small: 5 types of red and 5 types of white wine. True, those five are constantly changing. It turns out that Klaipeda people are not active wine lovers. They are more loyal to beer. So, the owner started to prepare own beer which became famous there - Red Bricks beer. It's great. Waiters really know their work, know what they offer, and what they are talking about. They are attentive, fast, and kind. When several orders come at the same time, new guests come in, and at the table next to ours a birthday is celebrated, the service starts to crash (it took some time to pay for the dinner). However, when you see that waiters don't really stay in place but do everything they can to keep everyone happy, it is not hard to wait for a little. As for service, I would also like to mention the snack which offered our friends - they took one desert portion for two. In such situations, at best, only about 10% of waiters bring a second empty plate to share. Here the waiter immediately asked whether they want to share the snack, and brought it nicely arranged in separate plates. Audience: foreigners, entrepreneurs, and Local upper middle class. Food: expensive (like wines), but worth every penny spent. The restaurant is wonderful. 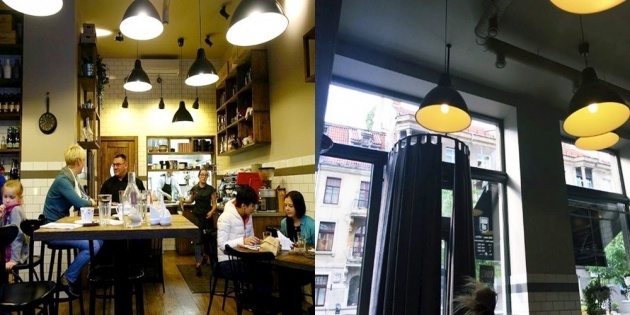 It has a cozy and non-traditional environment for Lithuanian taste. Seems the focus on detail. Food was delicious, and prices are acceptable in terms of quality, but for me - only on special occasions. It is not cheap, but quality food costs and, as you know, sometimes it costs too much. But not here. And the portions are no longer Scandinavian-style and not just for testing. It is adapted to the class of people who love delicious big portions. Resume. MOMO Grill 'is a cozy restaurant offering good and quality food. And many people say they are claiming to be one of the best in Lithuania. hide from the harsh wind or just without reason!